Discussion in 'Terry's Corner' started by Terry, Feb 13, 2019. 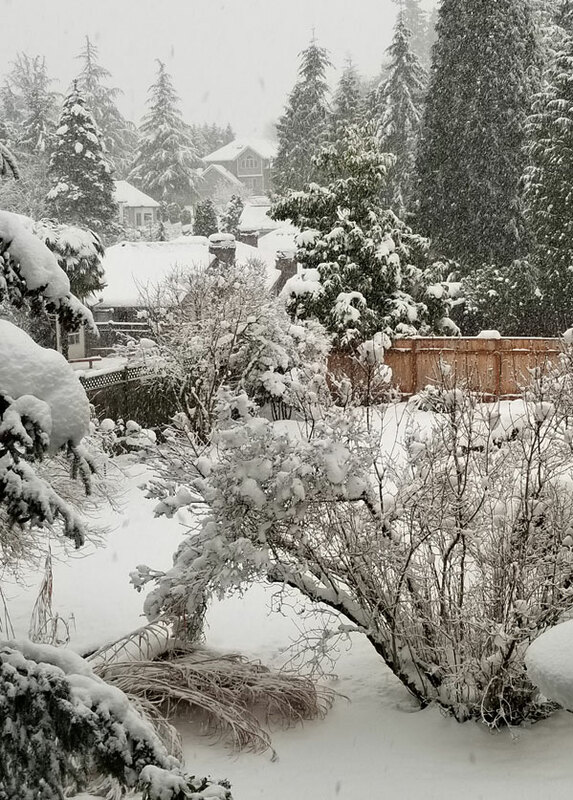 A Snow Day in Seattle 2019. Snowmageddon!!! With all of our hills and with the wet snow we get, it's like Snowmageddon here. It's nice seeing people off of work with their kids, with sleds and sliders out. It's also a chance to meet the neighbors as you are shoveling sidewalks and street corners so cars can get through the neighborhoods. 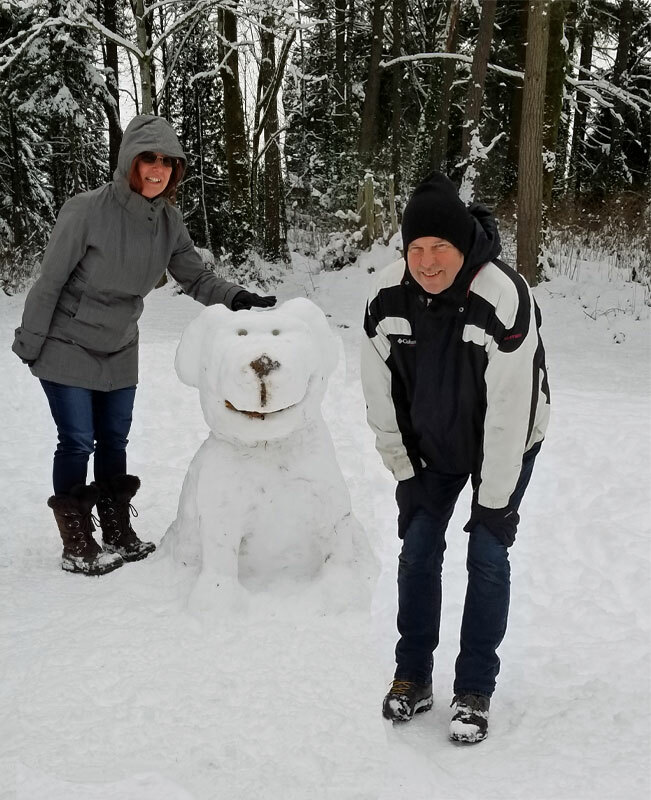 Pam and I came across this "Snow Dog" in the dog park nearby on our walk. And then it started snowing again. The morning after and the tree limbs that broke off. Many of those limbs had fallen into the street, so rigging up some rope I was able to pull the ones still leaning against the tree away without killing myself. They are really heavy in case you were wondering. We cleared the side walks and some of the street, then a plow came by and threw snow all over the side walks again. We went back out in the evening and cleared them again before it dropped below freezing again. 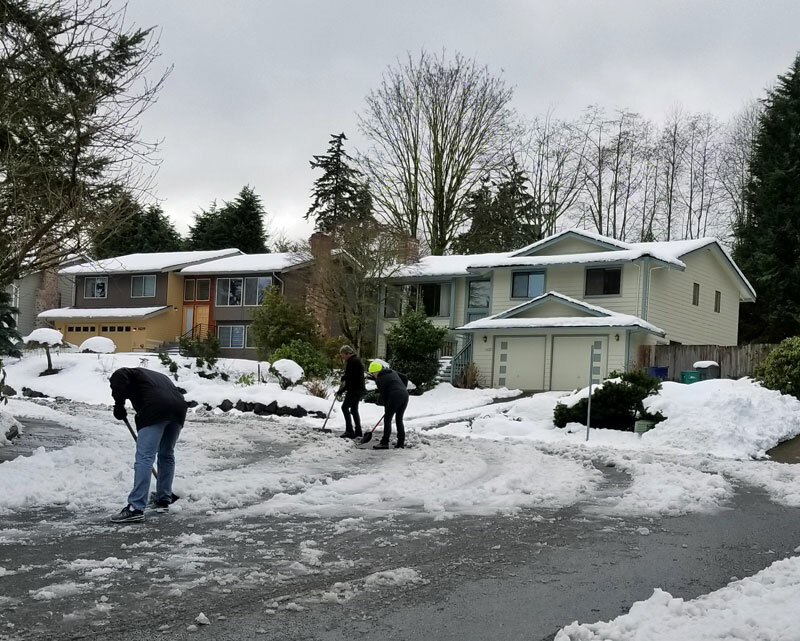 I'm the one in the middle with a shovel, and with two of my neighbors clearing a path for cars so they can make it up the last bit. It was a favorite stopping point for the cars and pushing them upward was getting to be a bore. this tree didn't know which way it wanted to go down. Someone had a chain saw. The car barely made it past. Has it all melted off yet or are you still digging out ???? The tree that was split in two is near Pam's place about a mile away. The tree in my front yard will be coming down after this and a different kind of tree planted as a replacement. Side walks are still a mess where they weren't cleared, and some streets are still bad. Seattle, the 2nd most amount of hills in the nation. When it snows here, there are parts that become impassable. The good thing, is that some Winters it never happens, and most years when it does, it might be for a day or two. This year is very unusual. How is your shake shingle roof holding up with the melting snows?? and I forgot to ask how is your mother and her house doing in this mess?? My mothers place does fine in the snow. A nice flat driveway helps. This was taken last Monday when I was dropping off things. On my place, I do plan on planting something nice to replace the tree that's coming down. Something that handles snow better fer sure. And my shake roof is working out fine in this too. My last home was a metal roof. So maybe metal or fiberglass shingles next time. It won't be shake again.